Being from the South you would think I would have eaten shrimp and grits multiple times because shrimp and grits just scream “southern food”. I however, had never had them. Honestly, I can probably count the times I have eaten grits before on one hand. It just wasn’t something we had very often at my house growing up. Recently, I have seen several pictures on Pinterest for shrimp and grits. I even had a shrimp and grits recipe sent to my email just after I decided I on making shrimp and grits for supper. Something about the recipes and the pictures made me want to have them. I honestly didn’t know if I would like them or not, but for weeks I have been wanting to try them. 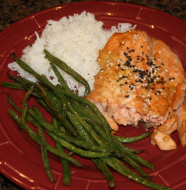 The boys and I had spent a majority of our day at the zoo and Jeffrey had volunteered his day doing some outside labor so I knew I would want an easy meal for dinner. This was it. As Jeffrey was recovering on the couch, he asked what was for dinner and I told him “shrimp and grits.” He asked if I had ever had them before and I said “no,” but that’s what we are having. (I think he was a little skeptical.) The meal came together in under 30 minutes and I’m sure if I had used quick cooking grits it could have come together even faster. The flavors were perfect. I loved the creamy grits with the slightly spicy shrimp. One bowl and I was content and full. I will be making this again and again. I never knew what I was missing, but now that I do I have thirty plus years to make up for not eating this wonderful southern meal. Bring 3 cups of water to a boil in a medium saucepan over high heat, covered. Uncover and slowly whisk in the grits, adding 1 teaspoon salt and 1/2 teaspoon pepper. Bring the mixture back to a boil while whisking. Reduce the heat to low and cook covered, stirring occasionally, until thickened, about 15 minutes. Add milk and cook an additional 5 minutes. Stir in the parmesan and 1 tablespoon butter. Remove from the heat and cover to keep warm until ready to serve. 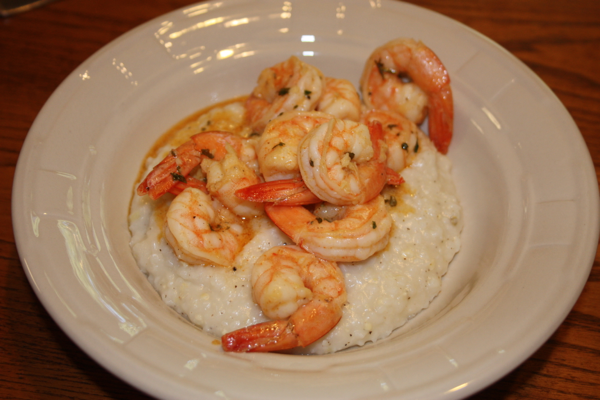 After you add the milk to the grits you can begin cooking your shrimp. Season the shrimp with salt and pepper, tossing to coat. Melt the remaining 2 tablespoons butter in a large skillet over medium-high heat. Add the shrimp, garlic and cayenne, cook, tossing, until the shrimp are pink, 3 to 4 minutes. Remove from the heat and add the lemon juice and parsley; stir to coat the shrimp with the sauce. Divide the grits among shallow bowls and top with the shrimp. Serve with lemon wedges, if desired.